Žádné další drahé předplatné! Začněte levným seznamem nejpopulárnějších bookmakerů a přidávejte víc bookmakerů jakmile zlepšíte své dovednosti! "SureBets" jsou známé taktéž jako "Sportovní arbitráže" nebo pouze "Arbitráže". Jedná se o jistou stávku, protože v určitém momentě se kurzy bookmakerů liší takovým způsobem, že se naskytne příležitost, kdy sázka na všechny možné výsledky události zajistí zisk bez ohledu na koneční výsledek události. "Middles" arbitráže jsou něco mezi hazardem a jistými sázkami. Jsou nejlepším spůsobem jak kombinovat všední sázení a sázky na jistotu. Musíte vložit sázku na zápas, který skončí jedním určitým výsledkem. Existuje malé riziko, ale zisk je o mnoho vyšší než při klasických "SureBets". Tato metoda je doporučená pro pokročilé sázkaře. "Polish Middles" jsou stejné jako "Middles" ale s opačným pravidlem - zápas NESMÍ skončit určitým výsledkem. Zde je riziko vyšší jako u "Middles" ale zisk je taky vyšší. Je doporučeno začít s klasickými "SureBets" než se pustíte do tohoto typu arbitráží. This Google Chrome extension will help you arbing easier than ever by saving you time and avoiding possible mistakes. 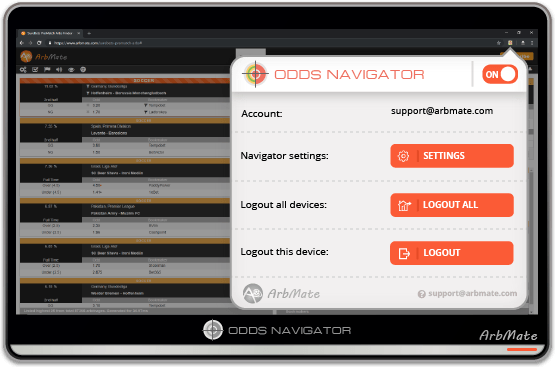 It could automatically navigate you to the betting event page, automatically select the odd and automatically fill in the amount from your arb calculator! All this on multiple computers and virtual machines at the same time with only one ArbMate account! It is 100% untrackable by the bookmakers as it acts as a normal user and goes to the desired point by clicking on the required links on the bookmaker - just like a normal visitor does. It just happens automatically and doesn't require any action from your side. Pouze použivatelé, kteří mají předplacený ArbMate, mohou uveřejnit recenzi. Had some difficulties after making my subscriptions. Customer support was amazing and resolved any issues I had in a matter of minutes. Очень хорошая скорость и навигация! After using it for over 2 months I can guarantee you it's worth every penny you spend on it. Plus they have a great customer support. I've not much to add: it does EXACTLY what you expect it to do. Giuseppe. You already have some main UK bookies like Bet365, WillHill, Betfred, Coral (Ladbrokes), Betfair Exchange and etc which combined with the Asian bookies works perfectly for me. Although you could add some more UK bookmakers like Admiralbet. But even if you don't add it, it's still a good service which brings a huge value to me. Keep up the good work! Live odds sometimes updates even before they are displayed on the bookmaker which surprised me very nice. I think this is the best alert service for me so far. Perfect price-quality ratio. The support team is also very polite. Cheap subscription prices and good value! The first sure bet service with Estonian version I have seen so far! +5 stars from me for this service. Very good sure bet software for using in Lithuania. Good bookmakers coverage and it is much faster than the others who pretend to be the best. You got me as a long-term member of your services. Keep the good working! I recommend it to people located in Lithuania. We recommend it, especially for beginners! The ability to start with low price subscription with the most important bookies and the option to add more bookies for such a low price which is a few cents per day is totally a great goal! This service is working perfectly and it's scanning the odds by themselves which is a huge advantage. There aren't any delayed odds because of bad scanning and the arbs are with high profit and great quality. We recommended it mostly to beginners. Great job! Very imppresive software. Good job. I've made some test comparing with other arbs softs and ArbMate is really the fastest arbs software. It works perfectly. Great software for professionals. I've been arbing since 2009 and I believe I have tried all the surebet softwares on the internet. ArbMate is my favourite so far. I recommend it. Congratulations for the great work. I made a lot of money thanks to you! You put a roof on my family for which I am very thankful. Keep doing such a great job guys so I could keep winning! If I can help with anything, just let me know! Just a perfecto tool to beat the bookies. Very fast arbs find. 5 stars from me. Respect! It's a pleasure to work with you guys! Great service. Your software provides everything I needed. Good sports and bookmakers coverage. You are updating odds faster then the other more expensive services. Great job! Great variaty of bookies. Nike.sk is the one I mostly use in Slovakia. The place I live gambling is forbidden but with your VPS things changes. Tempobet is my number one bookie and as far as I can see you are the only service that have it. Thank you fo supporting it, because it's a great advantage for Turkish players like me. Best service on the market for me!